I rented a capsule coffee machine for RM1?? | C A N D A C E .
Ciao friends!! 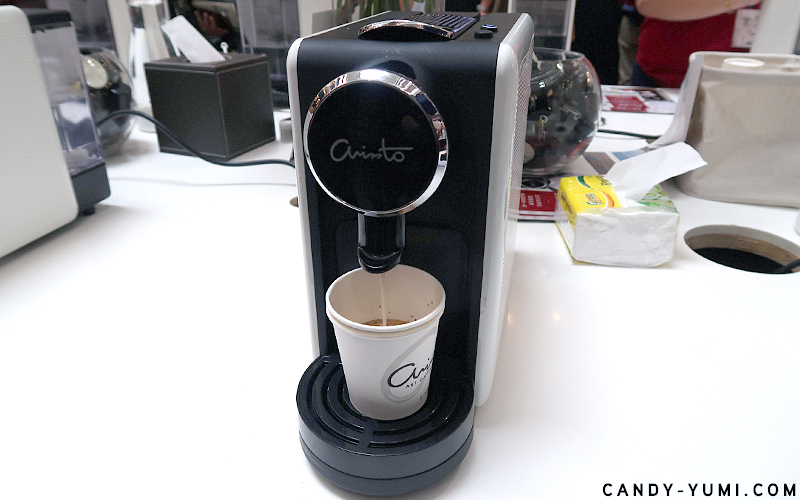 If you've read my blog entry on my little visit to Malaysia Coffee Fest 2018, you probably already know that during my visit to the event I rented a capsule coffee machine from Arissto Coffee's booth. After placing my order at the event, the machine was delivered to me about two weeks later and I promised to write a detailed post covering the renting process and how much I paid etc. As I've been using the machine for a full week now, I'm finally ready to share my first-week impressions on the machine and their capsules with you guys! 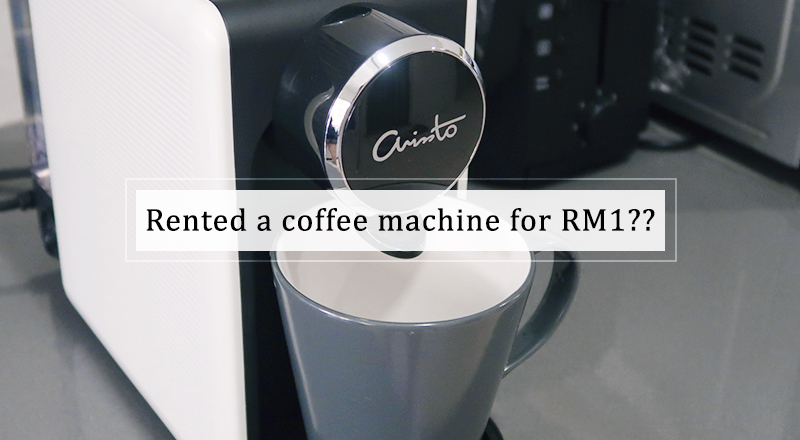 If you're interested to read my two cents on the RM1 Arissto Smart Coffee Machine rental promo, do keep reading until the end! Jumping right in, this slim and sleek machine here is the capsule coffee machine I rented from Arissto Coffee. 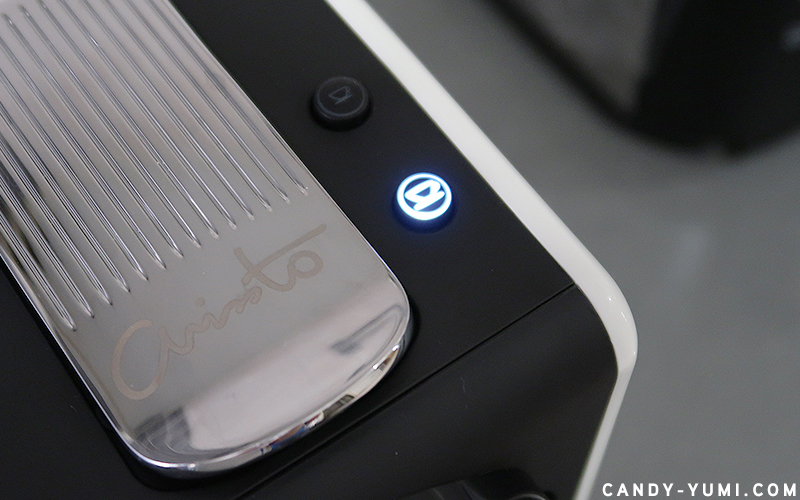 It is their Smart Coffee Machine and based on the website, the machine retails for RM1580. 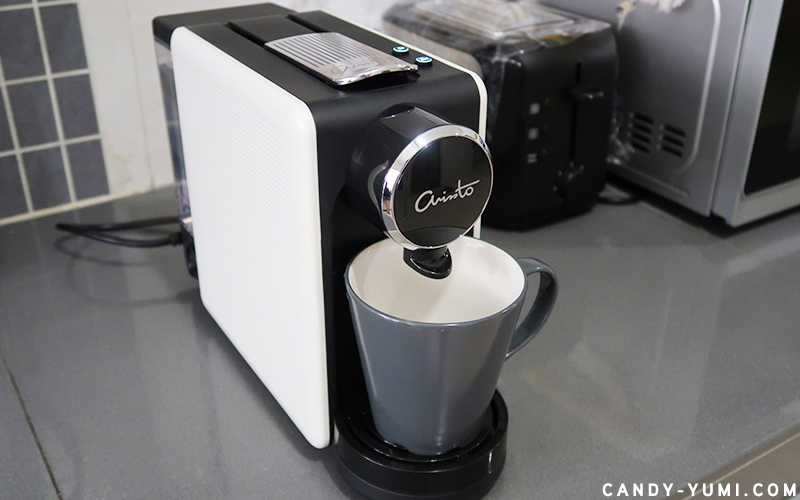 If you sign up for their coffee machine rental promotion, the 'monthly rental fee' for this machine is only RM1 per month with a minimum purchase of 1 box of capsules each month. Oh and no deposit is required either!! Any maintenance required for the machine is free (unless you literally break and drop the machine then i'm not sure what's going to happen la) and the machine is delivered by Arissto's staffs themselves so they will be there to help you set up the machine and teach you everything you need to know about it. How much I paid in total?? Each box consists of 10 capsules and if you signed up for their rental promotion, each box of capsules is only RM21.60. I don't drink much coffee at home so I only opted for the minimum 1 box of capsules a month. In total, every month I'll be paying RM22.60 /month (RM1 to rent the machine + RM21.60 for 1 box of capsules). No deposit!! The only down side I can think of is that because my capsules are delivered to me once every four months, and I'm ordering 1 box a month I can only choose 1 capsule flavour for that four months. Not sure if I understood correctly la but basically from what I did understood is that for my 4 months worth of capsules (total 4 boxes), I cannot mix and match different capsule flavours. If I choose Luna, all 4 boxes will be Luna. For example if I want Luna and Passion for the next 4 months, I'd have to order 8 boxes. This is what I understood la. Anyone reading this and has signed up for this promotion, if I'm wrong do let me know me ya!! Here's a few of Arissto's signature capsules I've tried. 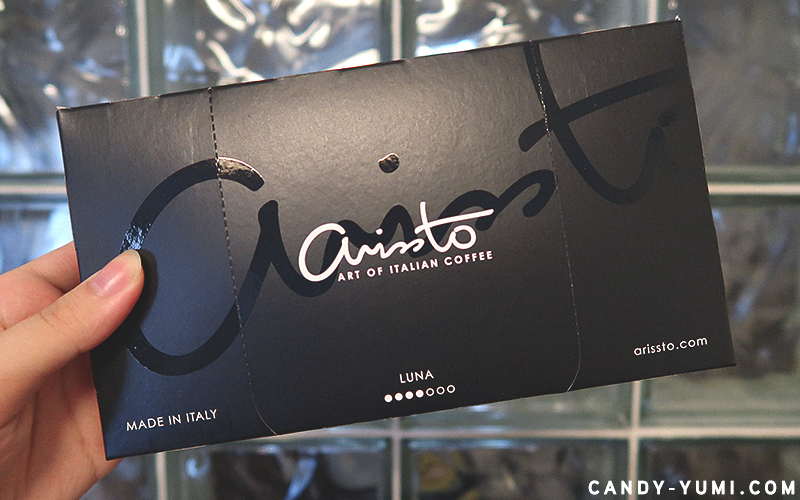 Luna, Passion, and Amico are coffee based capsules. Choco is chocolate and coffee milk is just milk. For a full range of capsules available you can refer HERE. We also heard that a series of tea capsules will be launching soon so I'm definitely excited to try their tea series once it's launched! Since I've tried all the capsules above, my favourite of the bunch is Luna (top black one). 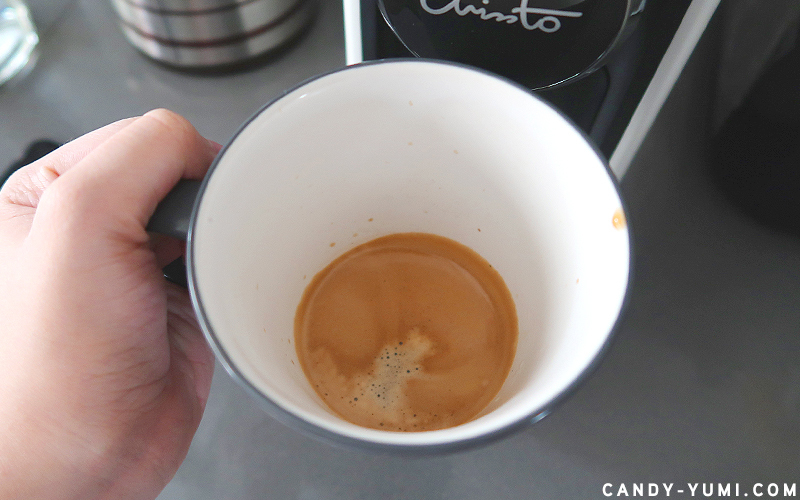 Although recommended for Espresso, I personally enjoy using Luna to make myself a cup of cafe quality caffe latte for half the price of what I'd normally pay for one at cafes. 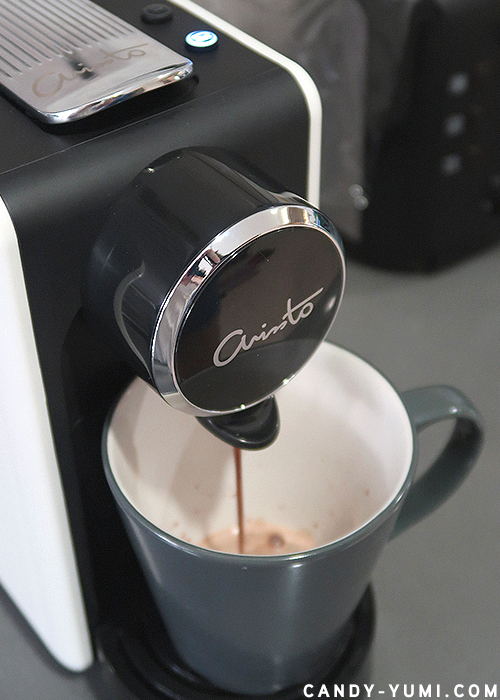 How to use Arissto's Coffee Machine / Is it easy? Using the machine is super easy!! I'm extra so I'll follow the recommended two-steps. If you're not particular, I guess you could skip the first step??? But I'll share what I normally do anyways!! So first things first, make sure your water compartment is filled. 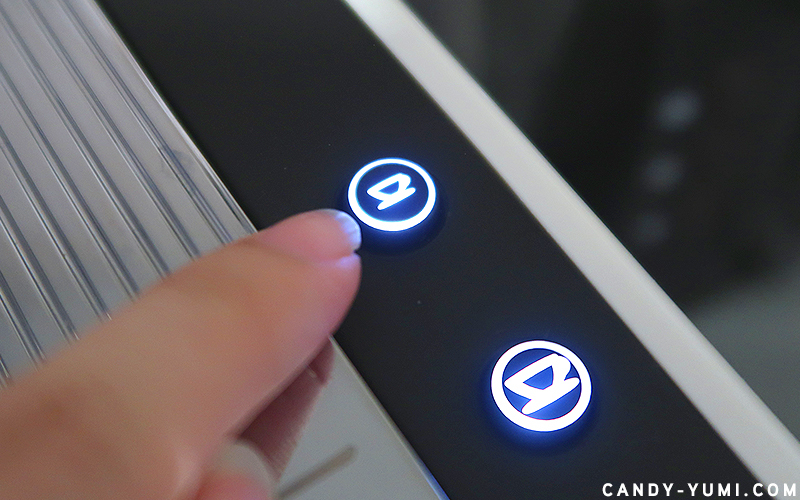 Flip the switch on and wait for a beep sound that indicates the machine is ready to be used. 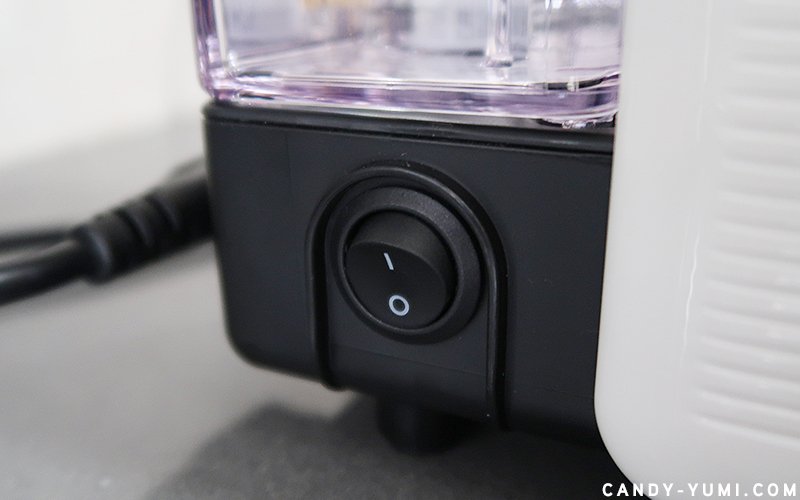 When it's ready, the two cup buttons would be lit up. Water will come out and if there's leftover coffee residue in the system, the water will come out brown, so don't panic, that's normal. After it's done, I'll pour the water away and I'll begin to make myself a cup of coffee. The process is pretty much the same. 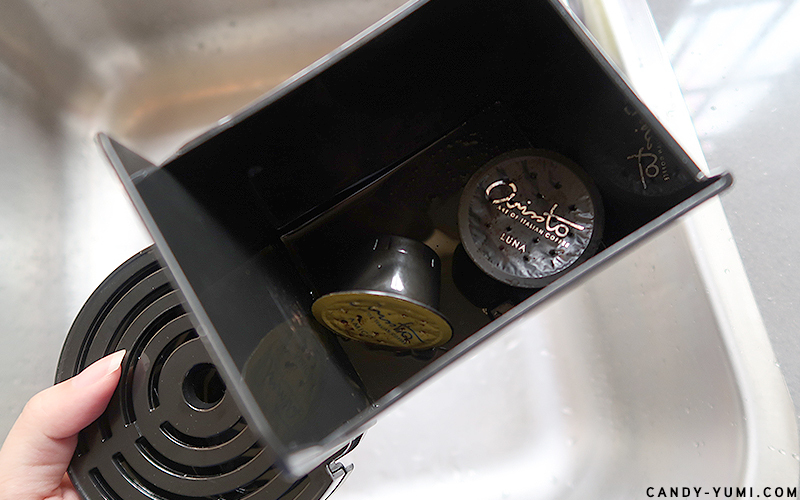 Just lift the lid up. 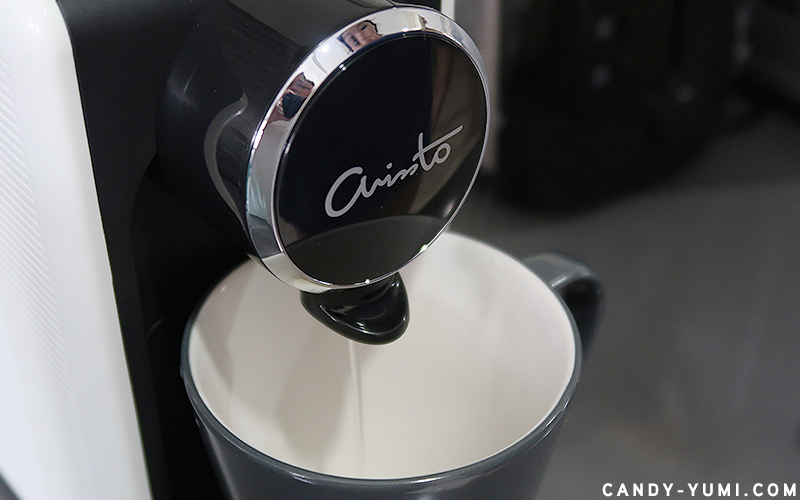 press the button, and watch the coffee pour out. I don't have an exact measurement but from my rough estimation, the small cup button is about 1/4 cup of coffee while the big cup is around half a cup of coffee. Small cup gives you this amount of coffee and since I only drink latte/cappuccino, I'll be adding milk. 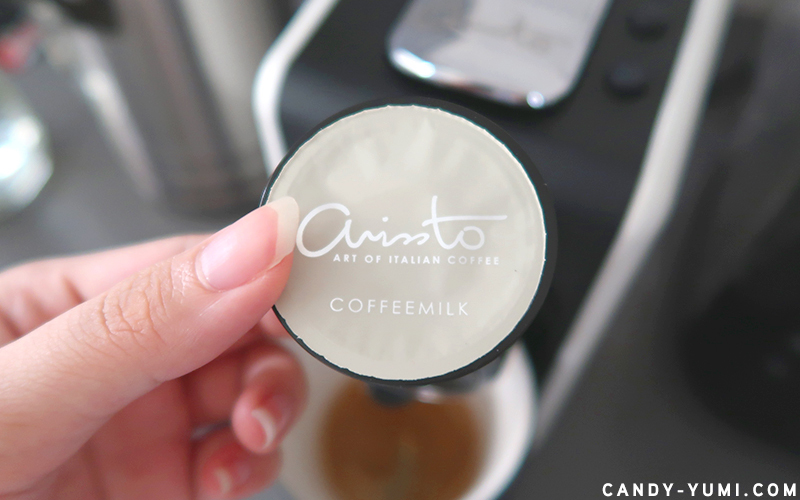 Arissto also sells Coffee Milk capsules. You could get these for the full Arissto Coffee experience. All ya gotta do is repeat the process once more with the milk capsule instead. 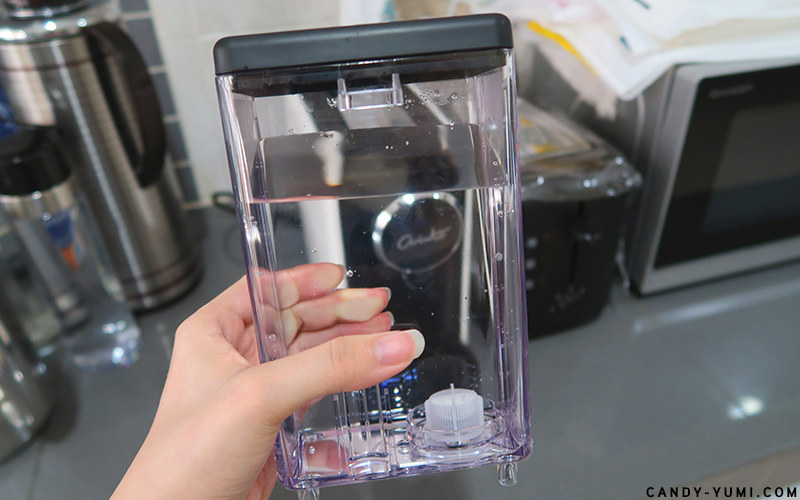 Once you lift up the lid, the capsule will automatically drop into the tray below! 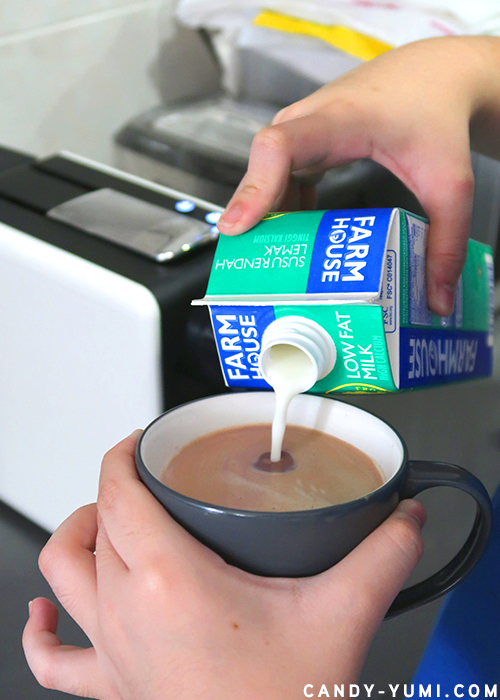 So if you're planning to use the milk capsules, once the previous capsule has fell into the tray, you can pop the milk capsule in. 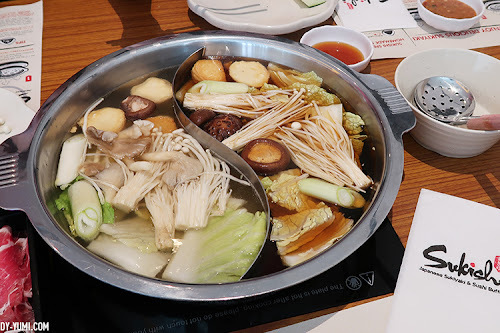 But hor, alternatively if you want to save cost a bit, you can also opt to use fresh milk la. I'll always have fresh milk at home so at the moment I'll just stick to that. Apart from saving some $$, if you prefer other variants of milk like almond/soy/coconut etc, feel free to experiment and improvise!! 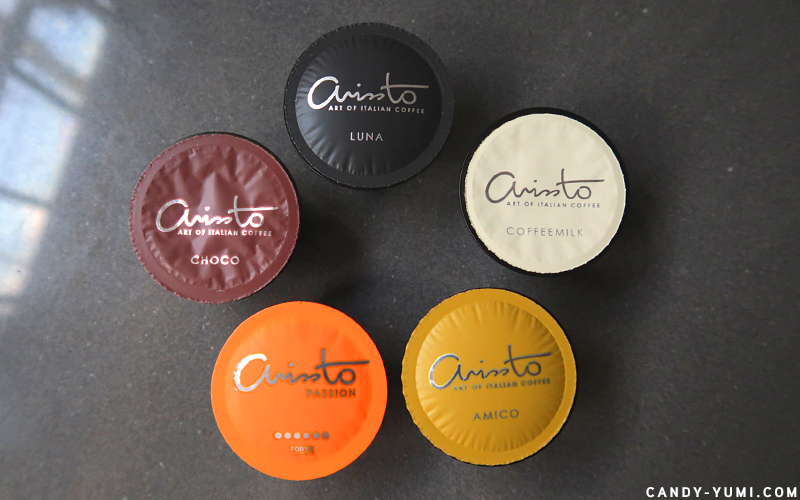 I tried their Amico capsule + soy milk the other day and it tasted pretty good!100% trying soy milk with Luna next time! By the end of the day I'll pull the tray out and give it a quick wash and that's it! When Lewin and Teh delivered the machine and taught us how to use it, Lewin also shared us some 'coffee recipes'. They gave us a few capsules of Passion so we attempted to try and see if we could DIY our own cup of Affogato with it. 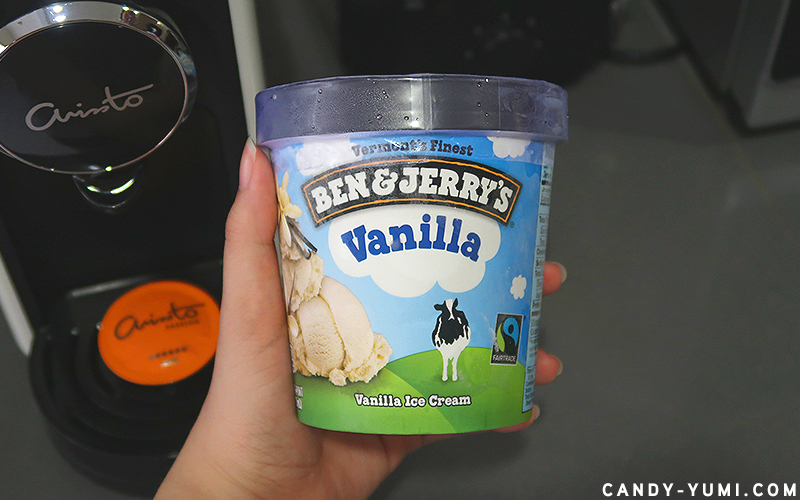 We didn't wanna try anything weird so we played safe and bought a tub of Vanilla ice cream. Placed the capsule into the machine and selected the small cup. and viola! The combination tasted better than I expected and thank goodness the vanilla ice cream was sweet enough because Passion was really bitter haha. In fact I think Passion would go well for a cup of iced caffe latte too! Overall for the past week I've been SUPER HAPPY with my decision to rent this machine. 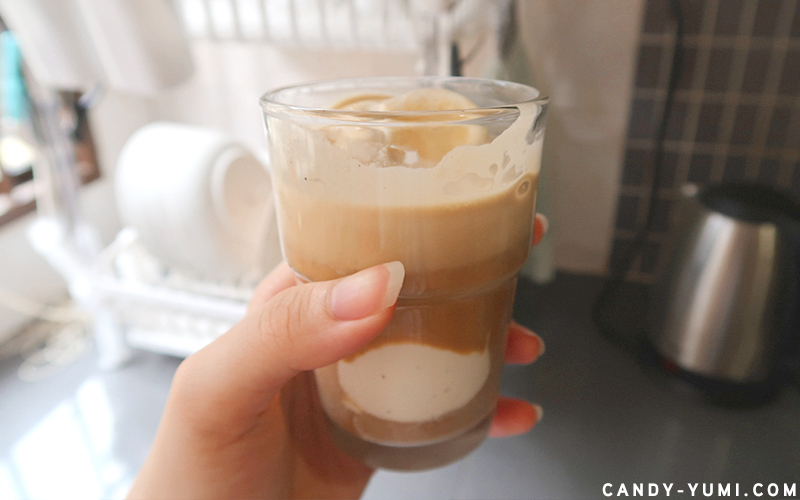 I enjoyed every cup of 'Luna' latte I made and my mom has been going on and on about how impressed she was with the Affogato haha. Personally, for someone that hardly drinks coffee at home, there's no way I'd pay RM1580 for a capsule coffee machine and on top of that, I'd still have to purchase the coffee capsules right? I'll admit, apart from being too lazy on most days to even make my own cup of coffee at home (despite the machine being so easy to use), I would still visit cafes for the ambiance. So cost wise, buying a coffee machine and rarely using it really isn't that worth it for people like me. 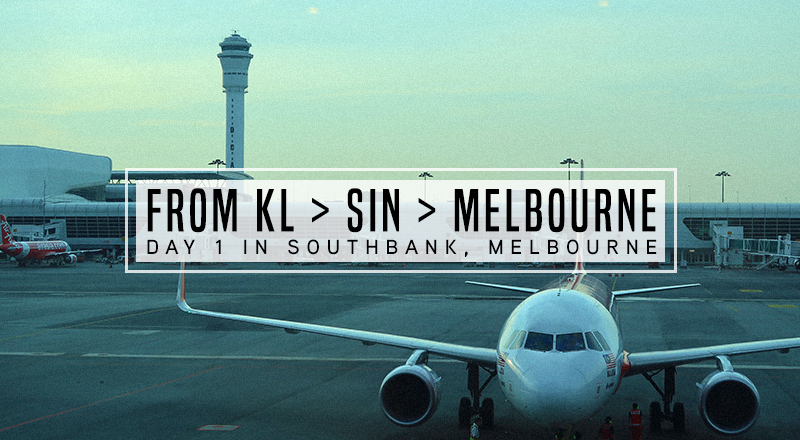 However, if I can rent a coffee machine for RM1 a month, then why not? 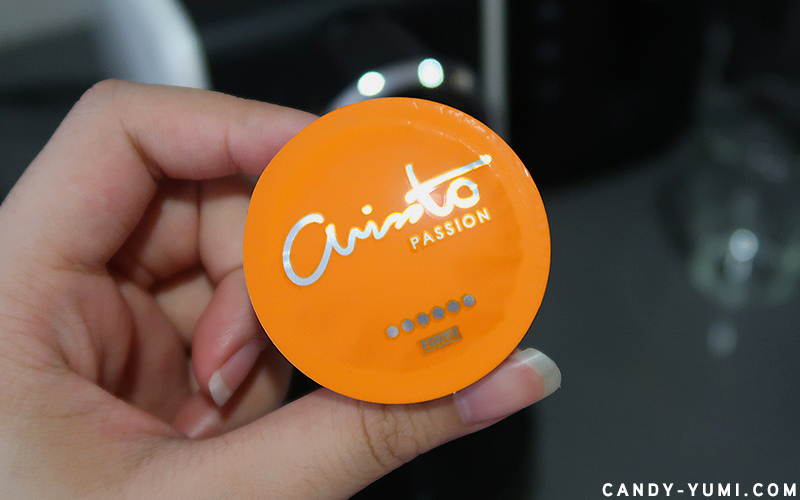 Especially when the coffee capsules from Arissto is actually pretty good. Best part of it all is that if I ever feel that I don't want the machine any more, I can just have it cancelled easily before the next capsules delivery, and I don't have to worry anything about not getting a big sum of deposit back or anything either! With these said, my first week with my Arissto machine has been great and I recommend that if you're someone that has always wanted a capsule coffee machine but has always think that buying one is too expensive, you could look into this RM1 Smart Coffee Machine promotion as well! If you're interested to find out more about this RM1 Smart Coffee Machine rental promotion, you can do so by filling up the form in this link HERE! Alternatively you could also give Lewin a call/text via this (+60 16 462 2126) number! 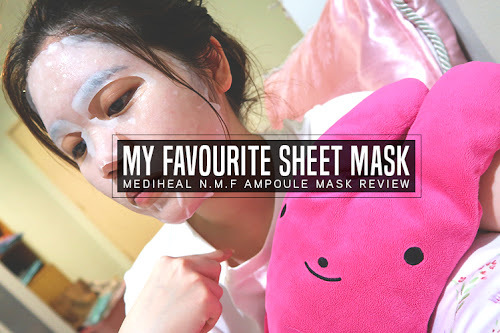 P.S I'd like to mention quickly that this post is /not sponsored/! 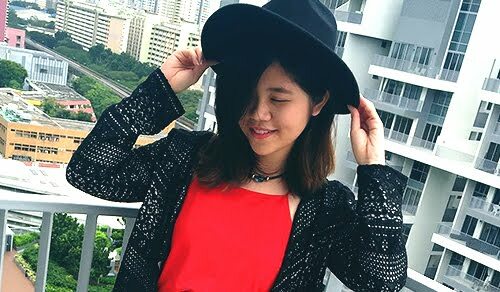 The link above is Lewin's partnership/affiliate link and I'm just helping to share it out. I don't get any commission from it okie! I signed up for the promo, rented the machine, and bought the capsules with my own money during the event. All opinions stated are personally what I truly feel about this promotion. I've always wanted a good capsule coffee machine at home and this promo is really a 'wishlist' checking decision so I'm genuinely happy ya'll! 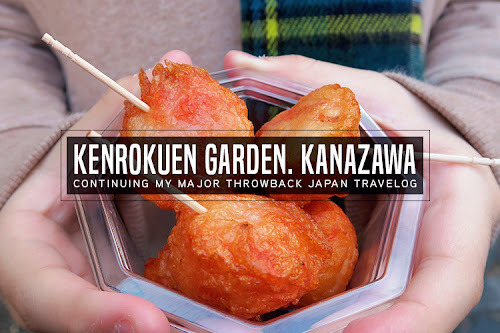 16/04/2019 Update!! Hey guys!! As you guys would know, I've rented this machine for a good 8months-ish and just a week ago we have cancelled our subscription and returned our machine. The reason why we have decided to cancel our monthly RM1 coffee machine rental was simply because we got bored of the coffee and we noticed how rare my family uses the machine haha(let's be honest, there's no way we'd give up other coffee options like my fav white coffee/cafe lattes/starbucks just because we have a capsule coffee machine at home lol). We were consuming the capsules so slow to the point where before we could even finish drinking our first shipment of capsules, a new shipment arrives LOL(btw, we were already ordering the minimum quantity of 40 capsules for 4 months haha). Hi, thanks for the details review. Is that a contract period for the renting? What if I stop halfway, do I need to pay any penalty? Thank you. I just heard about RM1 rental coffee machine from my colleagues and googled up for further details. Your explanation has been really helpful but wondering if this available for other states as well?